Location of Bolling Air Force Base, D.C.
Bolling Air Force Base is a United States Air Force base in Washington, D.C. In 2010 it was merged with Naval Support Facility Anacostia to form Joint Base Anacostia–Bolling. Bolling's property has been a Department of Defense (DOD) asset since 1917. From its beginning, the installation has included the Army Air Corps (predecessor to today's Air Force) and Navy aviation and support elements. The tract of land selected for the base was scouted by William C. Ocker at the direction of General Billy Mitchell. 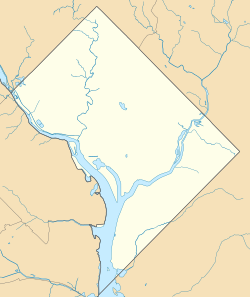 The base began near Anacostia in 1918, as the only military airfield near the United States Capitol and was originally named The Flying Field at Anacostia on 2 October 1917. It was renamed Anacostia Experimental Flying Field in June 1918. Not long after its acquisition by the military, the single installation evolved into two separate, adjoining bases; one Army (later Air Force) and one Navy. Bolling Field was officially opened 1 July 1918 and was named in honor of the first high-ranking air service officer killed in World War I, Colonel Raynal C. Bolling. Colonel Bolling was the Assistant Chief of the Air Service, and was killed in action near Amiens, France, on 26 March 1918 while defending himself and his driver, Private Paul L. Holder, from an attack by German soldiers. Flying activities began on 4 July 1918 with mailplanes landing there, with all equipment removed from the former location at the Polo Grounds, Washington, D.C. In the late 1940s, Bolling Field's property became Naval Air Station Anacostia and a new Air Force base, named Bolling Air Force Base, was constructed just to the south on 24 June 1948. Bolling AFB has served as a research and testing ground for new aviation equipment and its first mission provided aerial defense of the capital. It moved to its present location, along the Potomac in the city's southwest quadrant, in the 1930s. Over the years, Marine Corps, Coast Guard and National Guard units, as well as DOD and federal agencies also found the installation to be an ideal place from which to operate. In 1918, pilots from the installation were dispatched by President Woodrow Wilson to create the first permanent airmail route from Washington, D.C. to New York City. Navy seaplanes were first tested and Air Force aerial refueling techniques were developed by installation-based personnel and military commands. Following its successful transatlantic flight in 1927, Charles Lindbergh's "Spirit of St. Louis" returned to the installation. Soon after, the aircraft was utilized for Lindbergh's goodwill flight to Mexico and South America. Air Force Lt. Col. Henry "Hap" Arnold led a bomber flight from Bolling Field on a 4,000-mile journey to Alaska in 1934, to demonstrate the capabilities of long-range strategic bombing missions. Throughout World War II, the installation served as a training and organizational base for personnel and units going overseas. It also served as the aerial gateway to the nation's capital. The Air Force’s first headquarters was established at the installation, as Army Air Forces Headquarters in 1941 and, with the creation of the United States Air Force, Air Force Headquarters in 1947. The Sacred Cow, President Harry Truman's initial official aircraft and Franklin Roosevelt's only official aircraft, retired from service on the installation in 1961. This aircraft was the predecessor to Air Force One and was used for both presidential and VIP support missions. President Truman signed the National Security Act of 1947, which created the United States Air Force, at the desk on board this aircraft. In 1962, fixed-wing aircraft operations at the air force and naval installations ceased, due to congested airspace around Washington National Airport on the opposite shore of the Potomac River. The Air Force District of Washington (AFDW) was created and activated at Bolling on 1 October 1985 with the mission of providing administrative support to Air Force members. On 15 July 1994, AFDW was inactivated, but was reactivated 5 January 2005 to "provide a single voice for Air Force requirements in the National Capital Region" according to the base's website. The last fixed-wing flight out of Bolling Air Force Base, 1 July 1962. ^ a b c d e f g "Joint Base Anacostia-Bolling". www.cnic.navy.mil. Archived from the original on 20 February 2013. Retrieved 3 May 2018. ^ Editors, "Mailplanes Land at Bolling Field", Air Service Journal, Gardner, Moffat Co., Inc., New York, New York, 11 July 1918, Volume III, Number 2, page 53. ^ Pike, John. "Bolling AFB". www.globalsecurity.org. Archived from the original on 28 May 2017. Retrieved 3 May 2018. Wikimedia Commons has media related to Bolling Air Force Base.